As far back as she can remember, Elle Howe has loved cars. The Wilmington native’s ultimate career goal was to work in the automotive industry. But even she could not have imagined the roads she would get to travel as an NC State University student. This week, Howe graduates from NC State with a bachelor’s degree in industrial engineering and moves to Spartanburg, South Carolina, to join the Engineering Operations Management Program at BMW, the company where she interned multiple times during her five years at the university. Howe chose NC State because of the value and opportunities it afforded. Elle Howe in Munich, Germany, winter 2014. Among those opportunities were, not one, but four internships with BMW – three working in vehicle quality at the plant in South Carolina and one at BMW’s headquarters in Munich, Germany, where Howe applied the planning and computational skills she’d learned in her engineering classes to work on plans for a car that will be sold exclusively in the Chinese market. 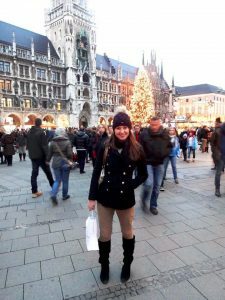 She also spent a summer in Prague, Czech Republic, where she studied global business and engineering while experiencing a multicultural environment. Toward the end of her freshman year, Howe applied for scholarships through the College of Engineering, and soon learned that she had been chosen as a Fitts Scholar – an honor that impacted her NC State education significantly. “The Fitts Scholarship introduced me to the Fittses, who are absolutely fantastic people, and also to other Fitts Scholars, which has been phenomenal,” she said. The scholarship has made a huge difference, because I was able to focus solely on my studies, internships and other activities that benefited my education; otherwise I would have needed to have a part-time job. Although all of these experiences took her away from NC State’s Raleigh campus for months at a time – her senior year was the first full academic year she had spent on campus since 2012 – Howe said she wouldn’t change a thing. This summer in BMW’s leadership training program, Howe will rotate through three different departments in South Carolina and possibly in Germany before deciding on the best professional fit. As she looks to the future, she sees a day when she can contribute to the education and experiences of NC State students in much the same way as the Fitts family and others who invested in her. “Over my five years at NC State, I’ve seen an amazing transformation. Each graduating class gets better and better: the students, the faculty, the university itself. Every single dollar that donors provide is worth that much more, because so much knowledge and experience is being passed from one class to another and building exponentially,” she said. As a student, knowing how much the Fitts Scholarship and other donations to the university have meant to me, it is definitely important to me to be able to impact other students’ lives in similar ways down the road. Fueled by that same level of dedication that she applied to making the most of her NC State experience, Howe undoubtedly will reach that destination — and any others she envisions for herself.